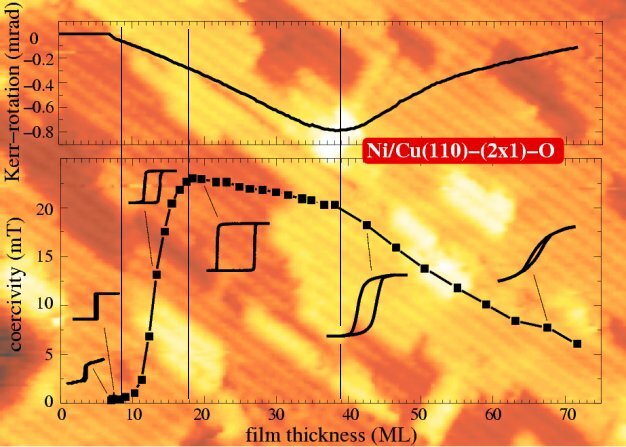 The magnetic properties of Cobalt covered Copper and related surfaces are studied together with collaborating groups of the Special Research Center "Thin Metal Films" (SfB 290) at the Free University. Especially the technique of Reflectance Anisotropy Spectroscopy and Magneto-optical Kerr-Spectroscopy (MOKE) will be applied at this system. Magnetic measurement by MOKE during Ni growth on a Cu(110) (2x1)-O reconstructed surface (Background: STM image after 12 ML Ni deposition).